I know, I know, the nut roast has had a bad press over the years. But thankfully the days of dried out bits of tasteless, hard, leathery tack are long gone. This lentil & Brazil nut roast is a perfect vehicle for all those delicious Christmas roast accompaniments, not forgetting the stuffing, gravy and cranberry sauce. It also stops the vegetarians and vegans feeling excluded in a mixed meal. I’ve teamed up with Cranks and the Vegetarian Society to extol the wonders of nut roasts and other alternatives to the big bird during the festive season. Eating more vegetables helps us all in our quest to be as healthy as possible; those leafy vegetables like cabbage and Brussels sprouts are full of vitamins minerals and phytonutrients. Don’t worry about those unpronounceable names – they’re great for your metabolism if not your vocabulary. Even the humble spud is a powerhouse, nutritionally speaking. For those wanting to reduce their intake of meat there are many delicious options out there. Take a look at the Cranks Kitchen winter menu for some inspiration. I’m very much hoping I’ll be able to make it up there for a meal myself in the next week or two. The apple, cashew and parsnip burger served with a plum ginger sauce has my name written all over it. I’ve been eating and enjoying homemade nut roasts for many years. In fact I’m a big fan and enjoy it more than ever I did the roast meat. The combination of lentils and nuts is probably my favourite. It makes for a moist loaf which has a bit of bite, but isn’t too chewy. I’ll happily add eggs to my nut roast to help with binding and to give additional nutrition, but they are not necessary and I’ve omitted them in this lentil & brazil nut roast recipe to keep it vegan and thus more inclusive. This lentil & Brazil nut roast is easy to make and very tasty. CT and other non-vegetarian friends and family have all tucked into it with gusto. The lentils provide substance and moisture and the nuts provide substance and flavour. I’ve used walnuts, cashews, almonds, hazelnuts, Brazil nuts or a mixture. All are subtly different, but all are good. I’ve included a sage and onion stuffing here to make it a little bit extra special for Christmas. The red wine gravy is rich and adds a note of festivity to the occasion. It’s also full of resveratrol, but hey, what did I just say about all those hard to pronounce phytonutrients? I’ve made many a nut roast over the years and eaten many more. Here are a few top tips for making your nut roast. It should first and foremost not be dry. Dry nut roasts are just horrible. But be careful not to make it too wet either, or it won’t hold together. You don’t want a dollop of sludge on the plate. Don’t use whole nuts. Your nut roast needs a good, but not overly chewy texture and lumps of hard nuts can be off putting. A rich umami flavour is paramount and I find adding a slug of good soy sauce such as tamari or shoyu really helps. You can use an egg to help bind the mixture, but omitting this means that vegans can partake of the meal too. The best nut roast ever. Simple to make and delicious to eat. Lentils & Brazil nuts are enhanced by a layer of sage & onion stuffing & rich wine gravy. Perfect for vegans and vegetarians alike, it goes well with all the usual roast vegetables and trimmings. Soak the lentils overnight in plenty of water. Give them a good rinse, then just cover with fresh clean water. Bring to the boil, add the bay leaf and celery and simmer covered for about 1/2 an hour until soft and the liquid has been absorbed. If you've added too much water, you may need to drain it off as the mixture shouldn't be too wet. Fry the onions gently for about ten minutes, then add the garlic and continue frying until the onions are soft and translucent. Remove the bay leaf from the lentils and mix in the onions together with the remaining ingredients. Pack half the mixture into a 2lb silicone loaf tin or tin lined with baking paper. Scatter the stuffing mixture over the top, then spoon in the remaining lentil mixture, pressing down to compact and create a smooth surface. Bake in the middle or bottom of a hot oven for about 40 minutes (180℃-200℃), depending on what else you have in there. Fry the onions gently in the oil for 10-15 minutes until soft and translucent. This can be done at the same time as frying the onions for the nut roast. Add the sage and breadcrumbs and fry for a further 2-3 minutes. Toast the nutritional yeast and flour in a medium pan over moderate heat for 3-4 minutes. Slowly add the stock and wine whisking as you go to avoid any lumps. Keep whisking until the mixture has thickened and is lump free. You may want to add more stock at this stage, depending on how thick you like your gravy. Add the remaining ingredients and simmer for five minutes or so, stirring occasionally until the flour is cooked out. Best to get the lentils soaking the night before you need them. The longer they soak, the more digestible they become. Can also be served with a tangy tomato sauce. This lentil and Brazil nut roast goes off to Jac at Tinned Tomatoes for Meat Free Mondays. Thanks for visiting Tin and Thyme. 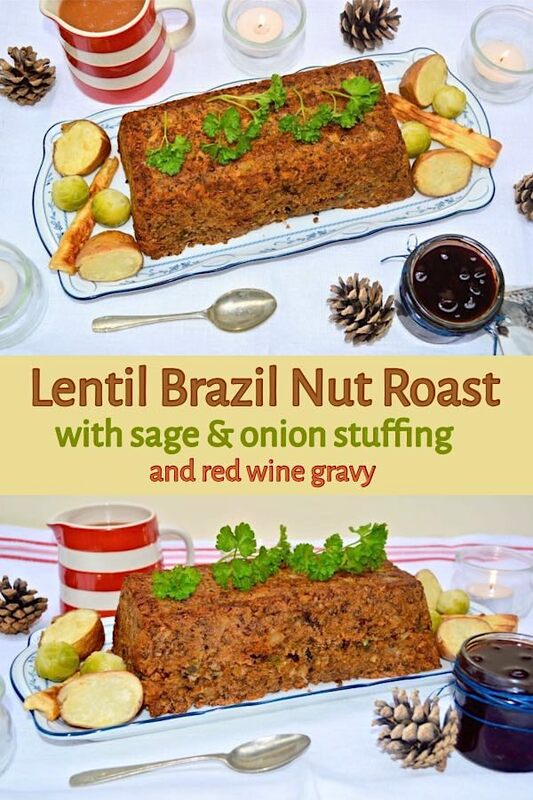 If you make this lentil and Brazil nut roast, I’d love to hear about it in the comments below or via social media. Do share a photo on social media too and use the hashtag #tinandthyme, so I can spot it. For more delicious and nutritious recipes, follow me on Twitter, Facebook, Instagram or Pinterest. Lentil & Brazil Nut Roast. PIN IT. This post was commissioned by Cranks. Opinions are, as always, my own. Thanks to my readers for supporting the brands and organisations that help to keep Tin and Thyme blythe and blogging. Exactly Becca. I hate it when you get a virtual veggie meal in itself for Christmas dinner and don’t really feel you can tuck into all the other bits and pieces. I’m loving the collection of nut roasts across our foodie blogs all drawn together by Cranks 🙂 This looks particularly delicious and would go down a treat with my vegan boy as well as the veggie rest of us! Thanks Chris. I had a hard time finding any nut roasts to link to when I did my post, so it’s good we’re getting a few more recipes out there. I’ll be hopping over to have a look at yours in a mo. I don’t understand why nut roast has such a bad reputation, because I love it! Yours looks delicious too. I will be making some over Christmas. 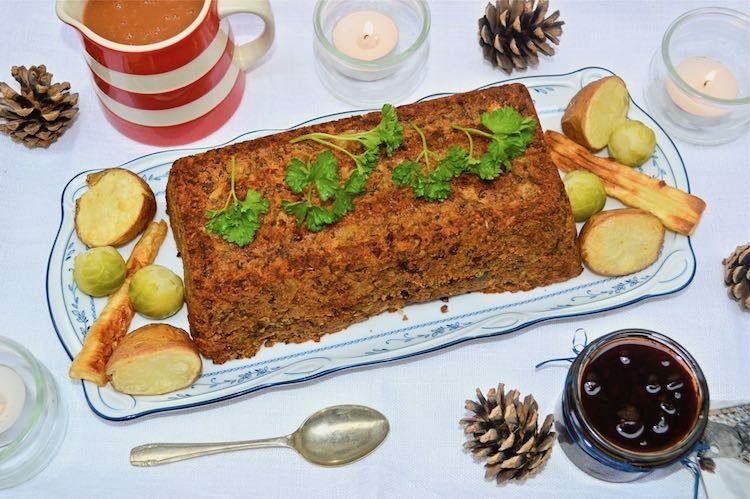 I’ve never had a nut roast before; it looks savory and wonderful; thanks for sharing! I haven’t used Brazil nuts for any type of veggie loaf or burger. Now I feel like I’ve been missing out. I’ll definitely pick some up when I come across them! Can I just say I am a meat eater. I don’t eat a lot of meat, in fact as a family we can make a medium free range chicken last at least 2 days. I love my veggies, including brussels, brussel tops and kale and I would happily sit down and eat this for my dinner. It looks so inviting and sounds delicious. I really would like to try and make this, maybe post Christmas when I can use up all the leftover nuts, assuming there are any! I do think it is important for meat eaters, not only to limit their meat intake and try meatless meals, but also to cater considerately for vegans and vegetarians. If I were cooking for a group and a couple weren’t partakers of meat, everyone would be served this nut roast. So important to be inclusive and all eat together. Fab post. Sammie. Ah thanks Sammie, you are lovely. CT eats meat, but is happy to only eat veggie at home. I think it would be good if people just ate a bit less and realised there are lots of tasty alternatives out there. Thanks for the inspiration, I was thinking of just bunging a nut cutlet in the oven for me this year as the rest of the family will have meat – but now I reckon I’ll give this recipe a go. It sounds delicious! No, no, don’t just bung in a nut cutlet! Do give this a go. You can always make a smaller quantity and it’s absolutely fine reheated up to a couple of days later. I can imagine this makes a lovely and filling main course for a roast dinner and the flavours sound delicious. Yum! Thanks Nazima. It’s such a flexible recipe, the flavourings can easily be tailored to suit. I’ve never had a nut roast before – and I feel like I’m totally missing out! Will have to add this to my must try list!! This is a really great meat alternative recipe perfect for the holiday’s! A lot of flavors and textures makes this sound far from boring! Well done! I am with you 100 percent Johanna. Having found something I really like, I tend to just do variations on a theme, but I really must branch out and try one of yours one day. I love how the stuffing is shaped, it makes for a lovely presentation, especially for the holidays, thank you for sharing this recipe! A nut roast is a brilliant idea for vegetarians and non. Nuts are very tasty and this recipe looks really good. Very nice! Never, ever had a homemade nut roast, even after 8 year of being veggie. However I do vaguely remember something in a can that I’m pretty sure called itself a nut roast, and I’m pretty sure I never even opened as it looked beyond gross! I’ve never done a nut roast before, but thanks to you I will soon! Been wanting to try some more exciting nut roast recipes this xmas so will bookmark this to try. Your nut roast has all the right tips to turn out perfectly. Looks wonderful and perfect for the holidays. Thanks Ali. 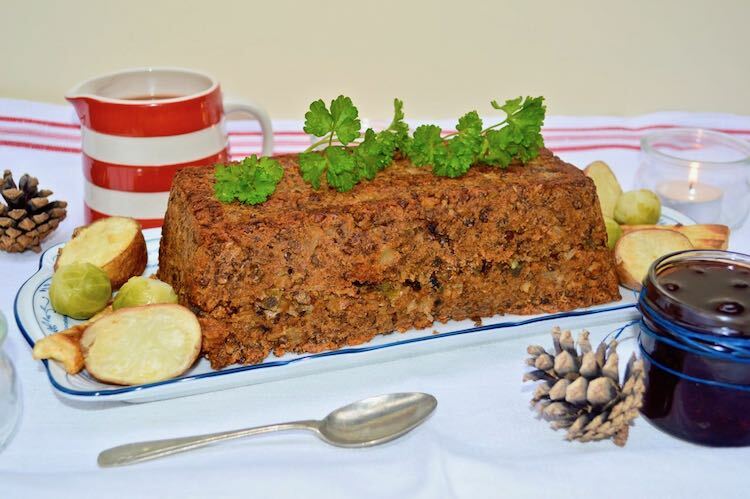 This nut roast looks good on any Christmas table and it tastes very good too. I haven’t had nut roast before, but I’m definitely intrigued! I love that you’ve created a healthier main dish! This looks AMAZING! Very healthy and must be very delicious too! This looks delicious and very moist. I would not mind this for xmas dinner. Thanks Nayna. I wouldn’t mind it for my Christmas dinner either. My mother is cooking this year, but I expect I will get something equally delicious. I love a nut roast, really handy tips you’ve given there too about the size of the nuts. Always good with plenty of gravy! Haha Fiona, I would be most surprised if you ended up eating a nut roast for your Christmas dinner. But it really is worth trying at some point. Yes, I will admit that nut roasts conjure up memories of tasteless school dinners! However, my tastes have changed a lot now and I love lentils so would love to try this out. Oh what a shame Donna. It’s so frustrating when we make something and it doesn’t go according to plan. Hope you fare better with this one. I love a good nut roast and this one looks amazing. Bookmarked! Well I must say your nut roast looks amazing Kate. I hope you didn’t mind me linking to it. 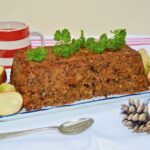 I was looking for a perfect nut roast to serve at my vegetarian Christmas dinner at home this year and this looks absolutely delicious! I have cashew nuts at the ready so I might have to substitute, but you have definitely inspired me. Thanks for sharing! I am always prepareing vegetables so these knifes would be very useful especially with the swede as these are very tough . Has anyone who posted comments actually made this or are they all just saying how great it sounds? I would much prefer to hear from people who can give feedback after making the recipe. I usually base my cooking on positive recipe feedback from others. I’m afraid I can’t answer that one as I can’t compel people to come back and leave feedback here once they’ve made one of my recipes. I do get feedback from people that have in all sorts of places, verbally, by e-mail, social media and sometimes in comments left here on the blog, but I’m afraid that doesn’t really help you with this one.